Meeting with Vice President of Iraq Nouri al-Maliki. 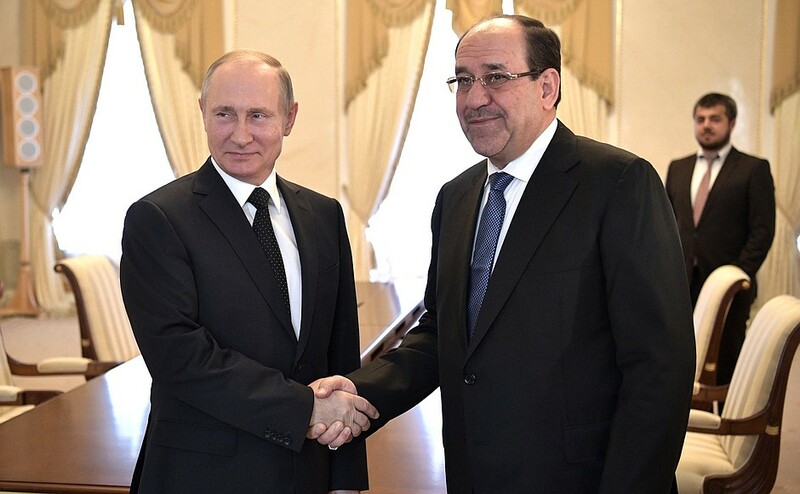 Vladimir Putin met in St. Petersburg with Vice President of Iraq Nouri al-Maliki, who is in Russia on a working visit, to discuss bilateral cooperation and the situation in the Middle East. Vladimir Putin with Vice President of Iraq Nouri al-Maliki. I would like to cordially welcome you. We first met back when you served as the Prime Minister of Iraq, and I am very happy to see you again. The situation in the Middle East and in Iraq remains challenging. We are fully aware of this. We have established an intergovernmental commission, and it is now hard at work. A lot has yet to be done in terms of economic cooperation. But there are other areas as well, specifically military technical cooperation. Russia is proactive in this area, and Iraq benefits from its assistance. Today, I would very much like to discuss with you the situation not only within Iraq or its bilateral relations with Russia, but also the situation in the region in general. Once again, I am very happy to see you. Thank you very much for your kind invitation, for the opportunity to meet with you and discuss questions of mutual interest that are relevant to our countries and the whole world. This is my third visit to Russia. With every visit, we take yet another step toward the common goal of further improving our relations. There is great potential in terms of cooperation, and our strategic choice is underpinned by an understanding of the important role Russia plays in the region and in Iraq. We have done quite a lot to step up our cooperation, specifically in energy, the economy and the military technical sphere. 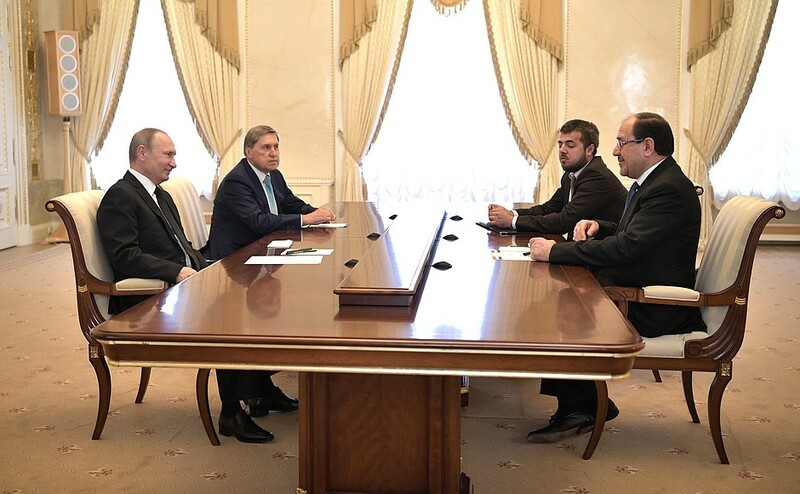 A number of agreements have been signed during previous visits. Russia and Iraq are implementing bilateral cooperation agreements, and we are committed to ensuring their full implementation. I am always eager to emphasize Russia’s immense contribution to preventing our region from falling apart, specifically in Syria and Iraq. You have our most sincere gratitude for that. If it were not for Russia’s contribution, the map of the region would have changed for the worse for us. Now that we have achieved so much in the fight against al-Qaeda and ISIS, we still recognize that more needs to be done to expand our cooperation. 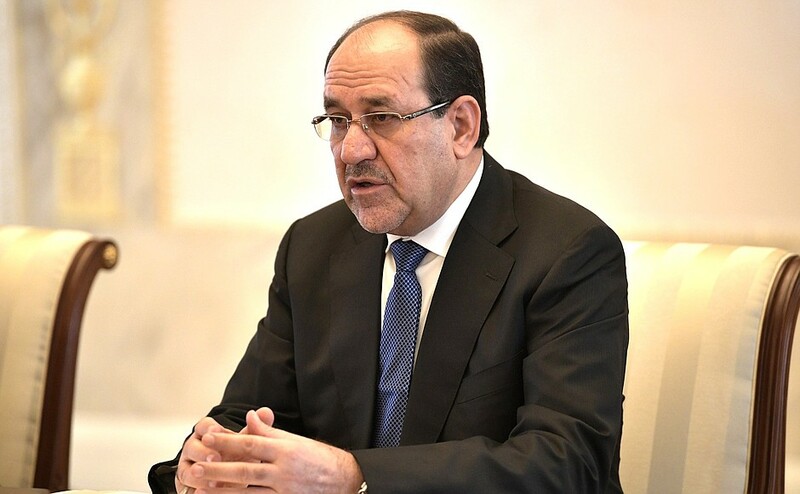 Vice President of Iraq Nouri al-Maliki. We have achieved a number of military victories in many regions, including in Mosul, so it is now time to focus on security, since these terrorists are poised to continue threatening civilians and cities. We now share a great responsibility to counter the ideology of terrorism and religious extremism, because it underpins the emergence of ISIS, and before that Al-Qaeda and other terrorist groups operating in Syria and around the world. If we continue to be guided in our relations by creed or ethnicity, we will leave the door open to the resurgence of terrorism. In 2011–2012, we succeeded in restoring control over the territory and overcame terrorism through military means. However, the specter of a resurgent terrorist threat will always be there, as long as Iraqis remain divided by religious quarrels. This is what happened in Syria. Given the current situation in Iraq, if the power continues to be divided on the religious or ethnic principle between the Sunnis, the Shiites, the Arabs, the Kurds, Christians and Muslims, this could result in a new round of terrorist activity. Therefore, we have prepared a special project, and we would like everyone who cares about the future of Iraq to help the Iraqi people. The idea is to restore real democracy, when the power is based on the victory of a political majority rather than on the assignment of quotas to various movements. 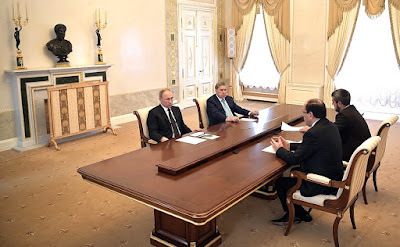 Vladimir Putin at a meeting with Vice President of Iraq Nouri al-Maliki. I would like to express my gratitude for and my deep appreciation of your personal efforts and those of the Russian Federation. At a time when we were subjected to a large-scale aggressive attack, which was launched for political purposes and affected the region and the global situation – I am referring to the fight against terrorism – Russia took an honorable and honest stance and agreed to speed up the delivery of weapons under previous agreements. We succeeded, of course, but we believe that the only option for the terrorist organizations is to foster religious strife. This will be their strategic choice. Hence, we must be ready in both military and political terms. I believe that an exclusively military solution cannot help settle the crises in Iraq and Syria. We must make political efforts and find solutions that would put an end to strife between various parts of our society, a strife that has lasted for the past 14 years since the fall of the regime in Baghdad.